Holy moly!!! I haven’t updated in a while and lots have been going on. I’ll try to keep it all in order and I hope I don’t repeat too much. We have officially lived in our new home for over a month now. Still need to do a lot of stuff/get a lot of stuff for it but it’s coming along nicely. 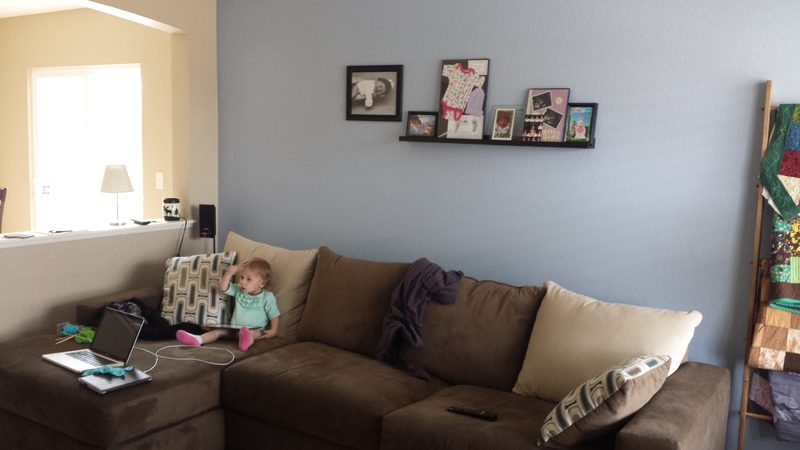 I have painted Olivia/baby’s room and the living room. I plan to just wait a while to paint my room because it’s so very large and not necessary yet. For the living room, I just added a blue accent wall because I thought the color went very well with the existing wall colors in the house but didn’t want to do the whole room in the color and then hate it in a few months. We also got a brand new couch to go with everything. I like it a lot. I plan to make a sofa table to go behind the couch. I can’t wait to get that going. I painted the baby’s room a very light gray color. It almost looks white. 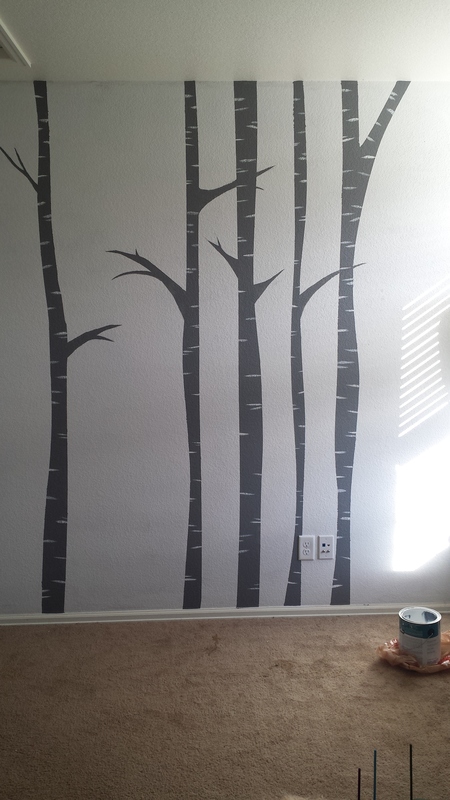 Then I painted a few trees on one of the walls for a cute accent. I couldn’t afford the tree decals that you can find online so painting them was my next option. I like how they turned out. I still have so much to do in that room to make it “finished” before baby comes. Also, the crib is in front of the trees so it hides the wonky bottoms. So….I’ll try to keep everything in order. Starting with Halloween. This was Olivia’s first real halloween. I made her costume. She was a little skunk. And I took her trick or treating around out new neighborhood. At first, I only planned to do our little street because I thought she would be so nervous about asking people for candy. I was so wrong. Before we left, we had a few kids stop by and Liv got to see how they acted. 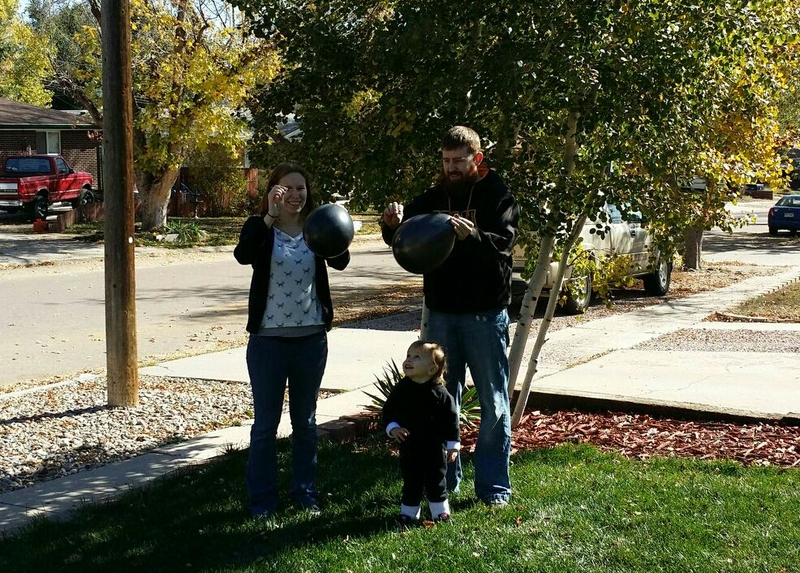 At the very first house, I asked her to knock and then she said “trick or treat” and thank you all by herself. Such a smarty pants. She had so much fun that we did several streets until I was tired and too cold to keep going. The next morning she asked to go again. And the day after. She really really loved it. That morning was pretty special too. 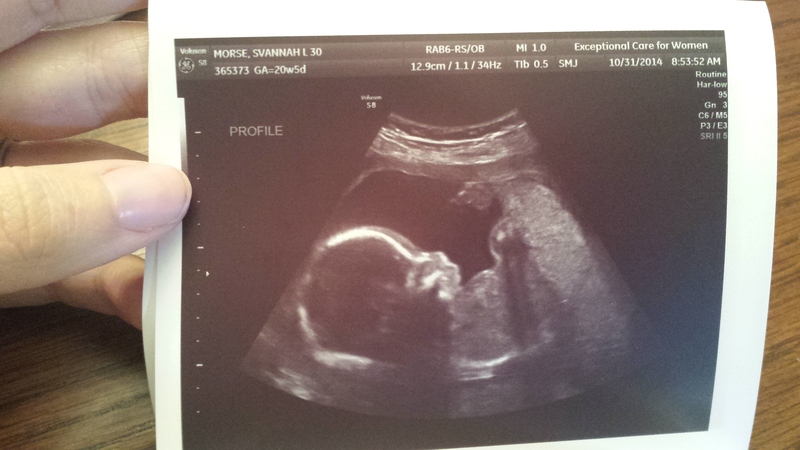 We had our 20 week appointment (anatomy scan) of the baby. Yea, as I’m writing this, I’m 22 weeks, 23 tomorrow. It’s going pretty quickly. Getting to see the baby was good and always fun. And showing Olivia was pretty cool. Everything went well, baby is doing well. 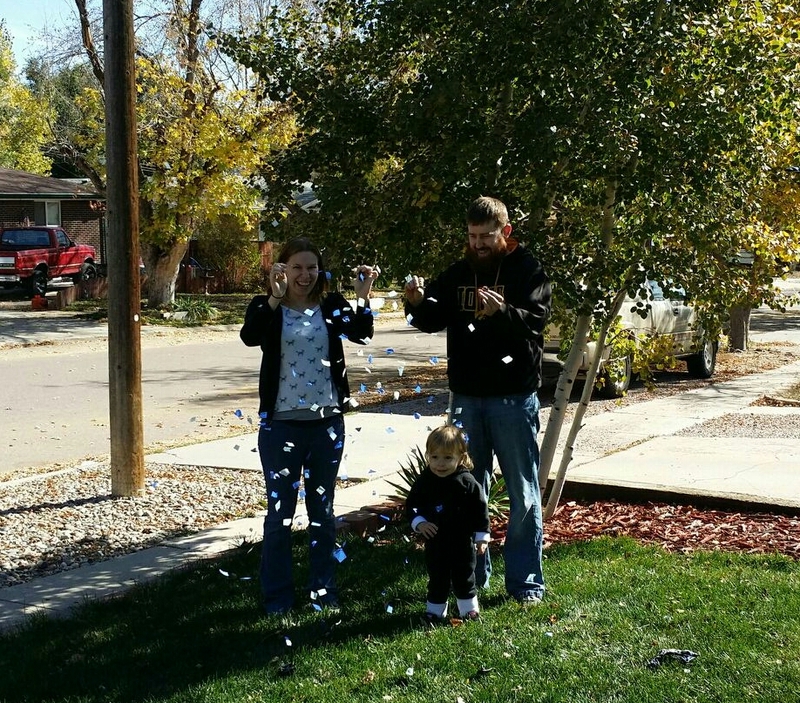 And….we found out the gender…..it’s a…..
I’ll be honest, not exactly what I was hoping for. I wanted another little girl so Olivia would have a sister. Plus, I know nothing about little boys, I have none in my family. So I’m extra nervous but the idea is growing on me. I’m sure I will love him just as much as I would have loved a little girl. Picking a name has been pretty difficult. We can’t decide on anything together. Hoping we can get this figured out soon. He is pretty active too. Kicks a lot, he yawned during the ultrasound and spread his little toes. It was so cute. Olivia is now 23 months old. It’s hard to believe she will be two very soon. She loves counting and she actually tries to sing her ABC’s. She is good up until G and then great from S and after. It’s just the middle that confuses her. We don’t have a chalkboard anymore so we have to resort to this method of photos for these last 2 months. Thankfully it’s only 2 photos….she had a hard time holding it where I could see it in the photo and not cover her face. Silly lady. So I have been getting back into sewing finally. I don’t actually have a spot set up in the house for my gear but I plan to soon. We have a whole unfinished basement I can use, I just haven’t gotten to it yet. So I set my sewing machine up on the floor in my bedroom. I actually finished quilting my king size quilt on my little machine. I’m thankful that that part is done. Just need to bind it. In the mean time, I have been working on little projects for the baby and Olivia. I had purchased some cute woodland flannel fabric a while back so I wouldn’t miss out on it and planned to use it as a crib sheet but when I pulled it out the other day, I realized it was too girly. So I am in the process of making it into a sheet for Olivia. I found a different flannel fabric that will work great with the theme of the nursery so I have that to work on next as well. So many little projects, but I enjoy it. I also started working. It’s seasonal but it’s better than nothing so I’ll be pretty busy next month along with getting the nursery ready, Olivia’s birthday party, potty training, and just trying to get the home more organized. I’ll try to post again soon with more finished or in progress projects. This entry was posted in Crafts, Family, Home, pregnancy, Uncategorized and tagged baby, blue, boy, fabric, flannel, gender, green, halloween, home, new house, nursery, painting, pregnancy, projects, quilting, sewing, skunk, trick or treat, ultrasound. Bookmark the permalink.